Fast Five might be the point where we can look at the reviews and say, “See, here’s where critics gave up.” The fifth in The Fast and the Furious series, which is now 10 freaking years old, actually hovers around 80% positive on Rotten Tomatoes as of this writing. It is very likely because whatever Fast Five promises, it delivers. 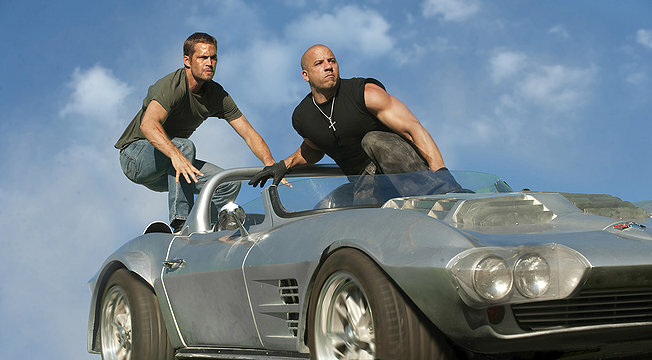 And if that’s the movie’s job, as most critics assert, then Fast Five should get good reviews. I’m on the side of “this still could be better.” And I’m not talking about better in some nitpicky way that all movies could be better. In all seriousness, if this movie is getting good reviews, then every one of the movies in this series should. Fast & Furious, the stupidly-named fourth film of the series, because Universal obviously doesn’t want to keep adding numbers to the original title, gathered 27% on Rotten Tomatoes back in 2009. I submit to you that Fast Five is not really any better than Fast & Furious, but like I said, critics have waved the white flag. Any why shouldn’t they, right? The series appeared to be dead after 2006’s Tokyo Drift made $63 million, compared to the over-$100 million-grossing first two films. But getting everybody, including the once-reluctant Vin Diesel, to return for a fourth film and get back to its basics was a shot in the arm for the series, and despite the worst reviews of the franchise, it made the most money, including an astonishing $70 million in its opening weekend. The critic has decided that if he can’t beat them, then join them. Fast Five has Dominic Toretto (Diesel), Brian O’Connor (Paul Walker), and Dominic’s sister Mia (Jordana Brewster) getting involved in a train heist of sports cars guarded by the DEA in Rio De Janeiro. They get a team of locals to help them out, but they have ulterior motives, and we are introduced to the kingpin with all the power, Reyes (Joaquim de Almeida, who many may remember as the kingpin in Clear and Present Danger). Dominic and crew ultimately take a car from the heist that has a computer chip of some sort in it, which is of utmost importance to the DEA, here represented by Hobbs (Dwayne Johnson, who really should have stuck with The Rock for his action pictures). Dominic’s crew is also suspected of tons of murders, so the DEA wants them for that too. What happens next is Ocean’s Eleven lite: Dominic and crew stages what amounts to an impossible bank heist, where Reyes’ money is being stored in a corrupt police headquarters. Through brains and brawn, and what ultimately is one of the most ridiculous and irresponsible action scenes ever, they hope to steal the money and not get killed or caught. But, if every car, building, and human being in Rio gets smashed, hurt, or killed, it will all be worth it. Yes, everyone, Fast Five delivers what it promises. But I’m not forgiving it for its sloppy action scenes, horrible acting, and impossible plotting. I mean, just because you deliver scenes people want to watch, doesn’t excuse laziness. It’s like ordering a pepperoni pizza and receiving it in a torn box with the cheese stuck to the top and several bites taken out of it. You still get to eat the pepperoni pizza, but it’s not as good as you’d like it to be. Fast Five is critic-proof, sure, but I still dissent even though this movie is going to make tons of money.